A haunted skeptic’s overwhelming fear of dying leads him on a search for definitive proof of life after death. Looking for some sort of relief from his consuming fear of dying, Miles Grissom places a classified ad offering $30,000 to anyone who can show him definitive proof of life after death. With the help of his skeptical mother Charlotte, Miles narrows down hundreds of submissions to three candidates: Dr. Ben Ellison, psychic medium Josefina, and entrepreneur Emmett Frum. Dr. Ellison attempts to give Miles a ghostly encounter by amplifying his fear center and returning him to St. Timothy Middle School in Temecula, where childhood classmate Kieran Seville died inside locker 530. The experiment appears to work until Charlotte finds a hiding boy dressed as the dead child. Ellison claims that Miles really did see Kieran’s ghost, and the young actor was only a failsafe to heighten Miles’ senses in the event the experiment did not work as planned. Miles goes to see Josefina, who says she can show Miles his own death from previous lives. Claiming she can see dead people, Josefina behaves wildly before explaining that a strangled man named Bill does not want Miles to go any further. Charlotte insists that she and Miles leave as they explain to Josefina that although Miles’ father was named William, he never went by Bill and he died in a car crash, not from asphyxiation. Outside Emmett Frum’s house, Miles unexpectedly runs into a friend who works in special effects. Miles leaves dejected when he realizes that his unsuspecting friend rigged Frum’s house with holograms and effects in order to fool Miles. While his mother sleeps, Miles follows an unlikely lead and meets airport runway worker Nelson Kinny at a fenced off park near LAX. Nelson convinces Miles to enter an abandoned house where Miles finds Nelson’s body lying dead on the floor. Miles collapses in shock. When Miles wakes, Nelson’s body grabs him and says that they are now together. Miles collapses again. When he regains consciousness, Miles flees the house. Soon after, Miles begins repeatedly experiencing visions of ghosts. Miles explains to his mother that he met a ghost who showed him its own dead body. When Charlotte realizes her son is experiencing haunting visions, she admits that Miles’ father did indeed go by the name Bill and actually hanged himself just as Josefina said. Miles returns to see Josefina. Josefina explains that Nelson is tethered to Miles, but Nelson cannot kill or possess him. Miles realizes that Nelson wants him to kill Nelson’s ex-girlfriend Alice so that her spirit can pass over with Nelson’s and release the tether to Miles. Miles explains to his mother what is now happening to him. Becoming more fearful herself, Charlotte starts glimpsing Nelson’s ghost. Miles meets Alice at Nelson’s funeral. Alice curses Nelson at the graveyard and is suddenly able to see Nelson’s ghost. Charlotte tries shooting Alice to save her son, but discovers that Miles removed her gun’s bullets. In order to protect Alice, Miles resigns himself to being permanently haunted by Nelson. Miles gives Charlotte the $30,000 to give to Josefina. Alice finds Miles at the airport park where Nelson used to walk. Fearful that Miles might eventually go back on his word to not harm her, Alice suddenly shoots Miles. Alice explains that she had a child with another man, which prompted Nelson to threaten he would kill her baby. To escape his persistent threats, Alice intentionally tainted Nelson’s heroin, which caused his death in the abandoned house. Alice flees while Miles bleeds out. Prompted by a vision of her husband when she goes to see Josefina, Charlotte rushes back to her son. Miles briefly dies, but paramedics revive him and he reunites with his mother. Miles suspects he is no longer haunted as he begins mastering his thanatophobia. For countless people worldwide, daily lives are routinely upended by anxiety, depression, and crippling fears of public spaces, people, or any number of debilitating phobias affecting mind, body, and emotions. For Miles Grissom, his fear is dying. After losing his father when he was only three years old, Miles grew up perpetually shaken by a skewed sense of his own mortality. Miles isn’t a complete recluse, although he closes doors to keep coworkers away, takes the bus to avoid driving a car, and convinces himself that the only way to conquer constant dread is to find definitive proof that death is not the end of everything. Miles places a classified ad offering $30,000 to anyone who can show him irrefutable evidence of a ghost, angel, afterlife, anything. Concerned mother Charlotte helps Miles comb through the crackpots, perverts, and pranksters until their list of hundreds is narrowed down to just three candidates for the cash. Supernatural scholar Dr. Ben Ellison believes he can conjure a ghostly encounter by heightening Miles’ fear center and forcing him to confront a childhood trauma. Psychic medium Josefina claims she can show Miles how he died in previous lives. Entrepreneur Emmett Frum assures Miles that he holds a rare Tibetan box whose mystifying contents can change anyone’s entire perception of reality. Ultimately, these are not the leads Miles is looking for. Instead, an unlikely clue introduces Miles to Nelson, an odd airport runway worker dead certain he can provide what Miles desires. When Nelson delivers on his promise, Miles’ quest to at last dip a toe into the unknown goes from uncertain lark to terrifyingly inescapable haunting. Some early scenes in “We Go On” are of arguable necessity, but co-writers/co-directors Andy Mitton and Jesse Holland slyly accomplish two things by taking this winding route through their setup. The first is that Miles is grounded in a believable arc of frustrating dead ends. This troubled man is on a transformative journey and there are no easy shortcuts sacrificing plausibility for the sake of compressing plot points. The second is that Mitton and Holland afford their movie an opportunity to play at the periphery of multiple sandboxes without committing to any one thread. When Dr. Ellison has Miles face the tragic history of former classmate Kieran, a bullied boy stuffed in a locker where he wasn’t found until summer break ended, chapter one sees “We Go On” indulging in the haunted house horror of slow creeps through hallways populated by flickering lights and shadowy jump scares. More mystery is injected with Josefina’s introduction, where seasoned viewers thinking ahead will sniff out a twist whose truth turns out to be not as predictable as it first seems. By the time Nelson takes momentum to full stride, “We Go On” finds itself further folding vengeful ghost yarn and psychological drama into its supernatural story of a struggle to connect one person’s past, present, and future through incredibly unlikely means. Blending these subgenres intriguingly transforms associated tropes into a thoughtfully-plotted thriller that gives “We Go On” a unique identity in horror. Bolstering that intrigue are outstanding performances from veterans John Glover and Annette O’Toole. Glover chews on average dialogue with such careful consideration for inflection that even ordinary exposition demands to be heard. O’Toole similarly gives gravitas through purposeful physical flourishes from subtle lip curls to more pronounced movements. These are exactly the right roles where an actor’s experience, particularly with Glover’s somewhat inconsequential character, elevates an onscreen personality into someone memorably multilayered, and “We Go On” capitalizes on its cast. Given that one of the film’s themes is coming to terms with loss of a parent, there is some sense motivating actor Clark Freeman’s apparent choice to play Miles like a shellshocked eight-year-old in a grown man’s body. However, Freeman’s perpetually scared, unblinking eyes and stiff way of walking are tuned way high. Freeman doesn’t put enough weight behind his monotone character, which is unfortunately highlighted by how much range co-stars O’Toole and Glover exhibit with theirs. Uneven acting could be a byproduct of directors Andy Mitton and Jesse Holland having only two feature films under their collective belt. Yet one area where Mitton and Holland exhibit intuition beyond their experience is editing. “We Go On” is consistently focused on what is most visually important during any given scene. Cuts during conversations don’t necessarily occur when dialogue shifts to another character. Each shot allows tone to settle first, establishing the desired note before moving on. Mitton and Holland have a confident handle on creating a deliberate rhythm, and that ability polishes their atmosphere with precision that few independent films can match. 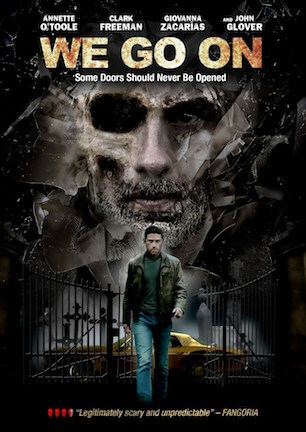 “We Go On” is reminiscent of the stylistically sparse, personally introspective moodiness that worked to similar effect in films such as “Absentia” (review here) and “They Look Like People” (review here). As previously proven with their first feature “Yellowbrickroad,” Andy Mitton and Jesse Holland are two highly interesting creators who can massage, defy, and dance around genre film expectations enough to make their movies seem familiar while feeling wholly unique. A more nuanced lead performance and tidier scene arrangement might grip for a more chilling chokehold, but “We Go On” remains a very human horror story that puts paranoid people above paranormal shocks. July 29, 2016 by Ian Sedensky.